Set against the mountains on one side of PCH and the ocean on the other, Trancas Country Market has got to be one of the most objectively beautiful shopping districts in the country. There’s the basic essentials: a Starbucks, a Wells Fargo, and a dry cleaner, all designed like individual barns. 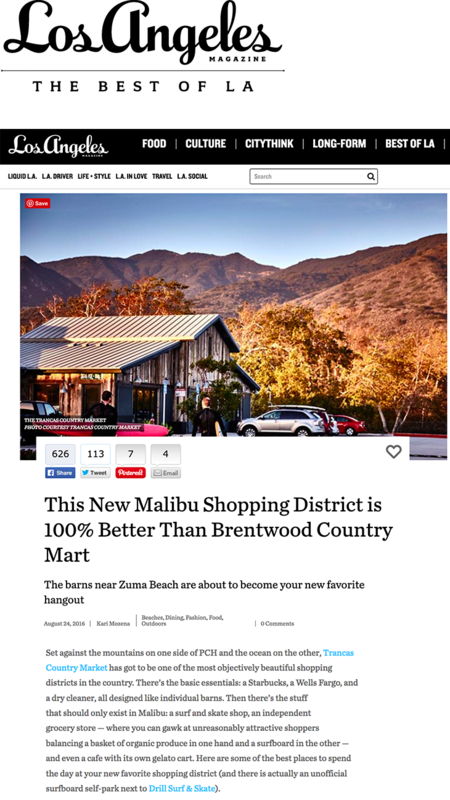 Then there’s the stuff that should only exist in Malibu: a surf and skate shop, an independent grocery store — where you can gawk at unreasonably attractive shoppers balancing a basket of organic produce in one hand and a surfboard in the other — and even a cafe with its own gelato cart. Here are some of the best places to spend the day at your new favorite shopping district (and there is actually an unofficial surfboard self-park next to Drill Surf & Skate). This gorgeous grocery store just celebrated its second year. Besides homegrown staples, you’ll find deli options such as a slice of pizza, teriyaki bowls with brown rice, and sushi. There’s also an impressive wine and booze section behind the array of cheeses with Malibu local Rande Gerber’s Calamigos Tequila out front. There’s cooked octopus packed in ice in the seafood department and a gorgeous-smelling soap line called Soap The Earth from Malibu’s Sequit Falls Ranch (our fave: Into the Woods) amongst all the soaps and lotions. The place is so popular that there’s a second location planned for the fall at The Promenade at Westlake. Head to a giant wicker basket at the back of the store and behold: $18 mix and match bikinis. But you also have to love the store’s indigo vegan handbags, kaftans, soft plaid shirts, and array of long necklaces on intricate chains. The flowy tops and skinny jeans definitely cater to the neighborhood. But if it’s jewelry you’re shopping for, make an appointment at Irit Design, the jeweler next door. Expensive candles with oceany names, gold flatwear, and coffee tables books on relaxing subjects fill this gift and housewares shop. If you’re lucky, you might even stumble upon the seasonal sidewalk sale outside the store. Like that sofa? You can work with them to create your own custom furniture using one of the many fabrics in the store. They also have wedding registry. The owners of 98% Angel used to have a shop in the Malibu Country Mart (which opened decades ago), and they’ve just opened near Le Village Café. Everything in the kids shop is made in downtown L.A. with the exception of the tiny, tiny Ugg boots, which are Australian. You have to love a store with an entire section of dance costumes and a “no scratchy fabrics” rule. Look up: the mobiles hanging from the ceiling are for sale, too. Kids’ artwork covers the back wall. Behind the grocery sits a wee barn that houses Sea Lily Malibu floral. It floats on a carpet of succulents with the tranquil Trancas Canyon Nursery behind it. There is either a cat out front by the smattering of Buddhas or a dog inside amongst rows of whatever special event centerpieces they are putting together. Last weekend, the floor in the barn was awash in pink dahlias for a baby shower. The place is also full of semi-precious stones and stone jewelry. The nursery that surrounds the florist has been there from the previous incarnation and is worth a slow wander through from the cactus’s to the New Guinea impatiens.